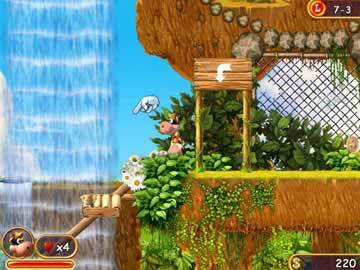 Supercow Game - Download and Play Free Version! Do you have the skill and courage necessary to take up the mantle of the infamous crime fighting heroine, Supercow? In this game, you'll find out! The once sleepy farm of Sunny Valley has been taken over by the nefarious Professor Duriarti, and it's up to Supercow to save her animal friends from a painful end as one of the madman's science experiments! This game artfully blends well detailed 2D images with softly rendered 3D elements to produce a game that's the perfect hybrid of both styles. The result looks fantastic and make for a very enjoyable gameplay experience. The warmth and fantasy of the game will bring you back to this title again and again! 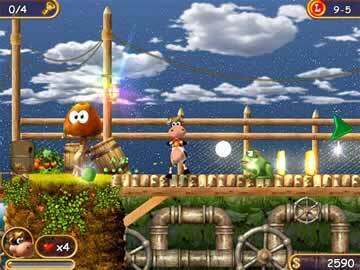 Supercow is the type of game that the entire family can enjoy together. The storyline is hilarious enough to keep everyone amused, but there is nothing scary or inappropriate in this title, meaning that gamers from 4 to 94 will all be equally entertained by this unique game. This game can be as fast or as slow as you want it to be. Are you a super gamer? Rush through the levels as fast as you can while attempting to avoid enemies and traps; it's quite the challenge! Do most platformers intimidate you? Fear not, because this game is just what you've been waiting for. Gone are the days of wandering aimlessly through maze like paths and platforms because this game tells you where to go next. The days of running out of time are also history since this game lets you go through the levels as fast or as slow as you like. It's a perfect fit for everyone! The game never forces you to find each and every thing in a level to advance, but for those players who just love to collect all there is to find, this game is a treasure trove of hidden swag. The game refers to these hidden caches as 'secrets' and they are available in every level. It's amazing what you find when you look! You just never know what will happen next in a game like Supercow. What initially appears to be the typical storyline involving a dastardly scientist quickly changes the game by providing sudden, unexpected twists and moments of hilarity. 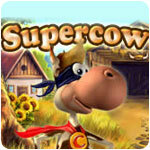 Supercow is a satisfying game that delivers a fast paced, engaging gameplay experience for all who play!